UltiCare® pen needles fit all pens sold in the U.S.
Be confident you’re choosing the best in comfort. 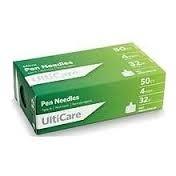 UltiCare® premium quality pen needles are manufactured with strict attention to detail. No wonder our needles come out on top in independent tests. The UltiGuard® Safe Pack allows you to easily access our premium quality needles and dispose of them properly. Each UltiGuard safe pack contains 100 premium quality pen needles or syringes. Once a needle has been used you simply pop it in the top, drop and roll it safely out the way. There’s no need to spend more on a separate sharps container. The UltiGuard is the convenient, affordable way to keep your home and community safe. Ulticare Pen Needles provide universal fit with all diabetes pens and dosers sold in the United States. Including the ones listed below to name a few. 1) Check the flow of insulin through the needle prior to every injection. 2)Attach a new needle prior to each injection. Needles are intended for single use only. Remove and destroy used needles after every injection. Do not use if the needle protective tab is missing or if needle appears to be damaged. Before using alternative needle length, consult with your healthcare professional.